When bringing together a group of people to form a board, committee, or ministry team, you will have possible cultural differences, perhaps different church backgrounds, as well as varying personalities, philosophies, and intellect. Consequently, you will have differences of opinion. We can learn how to deal with these differences in ways that protect unity by looking at the way God initially formed the Church by bringing together two very different groups of people — Jews and Gentiles. Therefore, remember that formerly you who are Gentiles by birth and called “uncircumcised” by those who call themselves “the circumcision” (which is done in the body by human hands) – remember that at that time you were separate from Christ, excluded from citizenship in Israel and foreigners to the covenants of the promise, without hope and without God in the world. But now in Christ Jesus you who once were far away have been brought near by the blood of Christ. 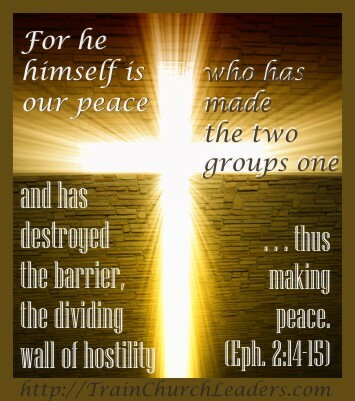 For he himself is our peace, who has made the two groups one and has destroyed the barrier, the dividing wall of hostility, by setting aside in his flesh the law with its commands and regulations. 1) Perspective: Differences of opinion are not a bad thing. God would not have brought together these two groups described as having a “dividing wall of hostility” toward each other if unity out of diversity was not possible. God was fully aware of the issues that would arise in bringing together the Jews and Gentiles into one body. Consequently, we must embrace our differences and learn from each other to arrive at something better than if we functioned alone. 2) Prayer: Unity, being at peace with one another, has a supernatural source — “For he himself is our peace.” Consequently, we must come together, by the blood of Christ, in prayer to the One who makes unity out of diversity possible. — “For through him we both have access to the Father by one Spirit.” Look together to the Lord in prayer to break through and destroy barriers. 3) Peace: Peace, not necessarily agreement, is what we must work toward. Consequently, we would do well in our board, committee, or ministry team meetings to establish guidelines on how to express grievances or disagreements. Scripture provides qualities that need to be exhibited and some that need to be avoided to prevent letting differences of opinion lead to division. 4) Purpose: The purpose is not to get my way or promote my agenda. The purpose is to rise together “to become a holy temple in the Lord … a dwelling in which God lives by his Spirit.” In other words, our purpose must be to get on page with God. Consequently, there may be times in a board, committee, or ministry team meeting that a decision must be tabled to make sure we are being led by the Spirit, not following our own ways. ← Previous Previous post: Trying to Attract People to Your Church by Watering Down the Truth?